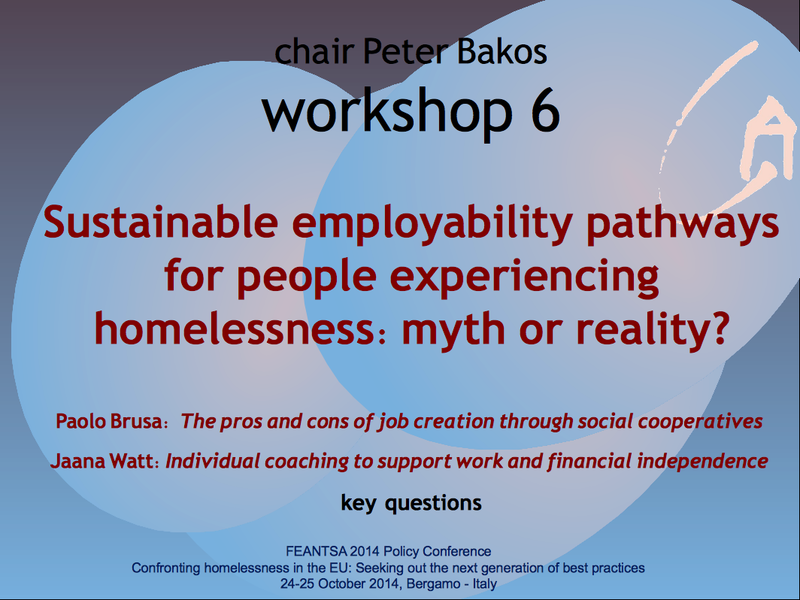 On friday 24 october 2014 I had the pleasure to contribute to the FEANTSA 2014 european conference by co-conducting with Jaana Watt the workshop “Sustainable employability pathways for people experiencing homelessness: myth or reality?”. The workshop was coordinated by Liz Gosme from FEANTSA & chaired by Peter Bakos from Refomix Hu. Liz, Peter, Jaana & me agreed on designing the workshop on an active participation structure. Usually during international events, the participants congregate in the audience following defined links, such as a common language & previous knowledge. The result is the creation of “safe-nest-subgroups”. We decided to propose a more in-deep confrontation & exchange with the offer of a double-generative path: from the general to the singular, & back from the singular to the general. The room have been prepared to harbor this setting, through the disposition of chairs in a series of small harbors, meaning semi-circles with one part open to allow participants to move in, out & around. Following this aim, the workshop design was clear: after the introduction from Peter, it was my turn to briefly introduce the dated-but-innovative framework of social cooperatives, exploring the rules & principles which represents quite hip concepts that, despite been called “innovative”, have been actually synthesized more than a century ago. Only few time was necessary to clarify the “glossary issue”. As Jaana would use the term “client” meaning the individuals we work with, we all agreed to avoid obnoxious comments on pretending moral truth: very soon we all agree that any digressions on terminology would have been accepted only by who use the term user (or similar) to call clients that are always right. 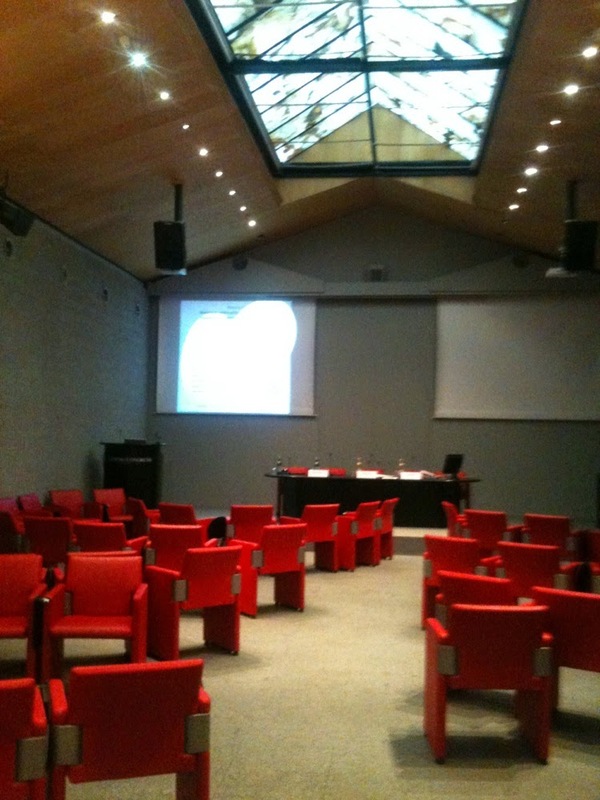 After a brief excursus on the social economy model of insertion into work, it was the time to focus on the pros & cons. For this part we agreed that I would have walked around the room, asking participants to silently stroll leisurely around the room, without any specific directions, but focusing on the various pros & cons that I presented meanwhile. When a particular “pros & cons” issue was perceived as significant, the participants were asked to stop wondering & find one's chair. This process allowed the creation of new sub-groups based on the progressive generative path grounded on the similarity of perceptions. The newly-experienced closeness was the result of the generative path from the general (the plenary of participants) to the singular (one's perception of the relevance of a specific “pros&cons issue”). On such basis, Jaana opened her presentation with a precise introduction to the coaching technique. Soon after, she proposed the participants to experiment the coaching support themselves, first in couple (one person experiencing the coaching position & one the client, then vice versa), & later confronting with other people around who shared the same sub-group space. The general share within sub-groups, & lately the possibility to have a general debate, represented the conclusion of the circular conduction of the workshop, closing the circle of a generative path from the singular (the perception of the meaning of both the coach & client positions) to the general (the plenary). To favor a smooth transition between different moments of the workshop, we decided to propose short cuts of job interviews. Specifically, we proposed the job interview for nsa from the movie Good Will Hunting (link here) & the job interview for a unpaid work from the movie The pursuit of happiness (link here). Oogway:My friend, the panda will never fulfill his destiny, nor you yours until you let go of the illusion of control... no matter what you do, that seed will grow to be a peach tree. You may wish for an apple or an orange, but you will get a peach. Oogway: No, you just need to believe. Promise me, Shifu, promise me you will believe … One often meets his destiny on the road he takes to avoid it. I greatly thank Liz & all at FEANTSA, Peter, Jaana & all participants that shared in & contributed to this session. Other materials from the FEANTSA conference will be updated as available on a dedicated page here asap.